Italian country decorating is done with great love and taste. Below is an Italian designer's thumbnail sketch of rustic Italian decorating and s-l-o-w Italian country living. ... from antique Renaissance marbles and gilt furnishings to simple cotto floors and rustic straw-seated chairs. This page is about the 'rustic end' of Italian country decor as it's done by 'regular' Italians. For palazzo Italian decorating, please check out the pages on Tuscan Decor! She grew up in the Italian regions of Calabria and Tuscany. 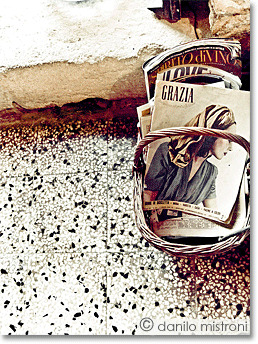 On this page, Sonia shares her personal memories of Italian country decor and rustic living. The walls in Italian country homes are either whitewashed or painted in warm earthy pastels (like apricot, for example). Sometimes walls are painted or stencilled with abstract/floral patterns as well. Interior textiles in Italian country style homes are mostly made of cotton. Some bedcovers are thick damask weaves - whites, creams and yellows are used in the summer, darker oranges and deep reds in the winter. 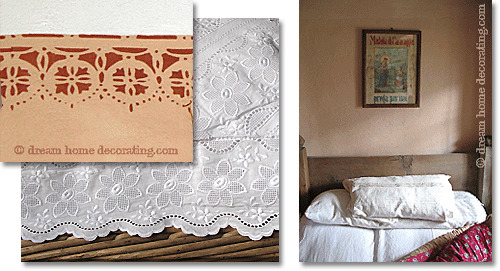 Bedlinen and table linen is generally white in Italian country decorating, and often hand-embroidered in white (or in a pale color), with crochet lace borders. The photo above shows houses on the island(s) of Burano in the laguna of Venice. You see, one has to get creative when it comes to letting airflow in and keeping the sun out! You'll find more information about this on the page about Italian Exterior Window Treatments. Wood is an important feature in Italian country style homes, with exposed beams as well as wooden furniture. But in this part of the world you'll see more dark-stained woods than in the central and northern parts of Europe. Tuscan and Calabrian country style chairs usually have straw seats. You can see that the Italian country kitchen above (right) has flagstones as flooring. These were usually made of locally sourced stone and came either as large slabs or in smaller squares. Fired clay is an alternative for floors: lighter terracotta or unglazed, deep Bordeaux red cotto tiles. In the photo below (left), they're interspersed with little marble squares for a more elegant type of flooring. There are two more options for flooring in Italian country decor: Firstly, ceramic tiles reminiscent of Italian Renaissance design (see the example in the living room photo from Assisi, above). Secondly, there's terrazzo, a composite type of flooring made of recycled marble offcuts (or other hard materials, like granite or glass). You can see finely ground terrazzo tiles in the photo at the top of this page, and a chunkier version next to the cotto tiles above (right). I've also taken loads of pictures to make sure I can pass all my latest Italian country decorating info on to you. You'll see what I mean when you read some of the chapters on Tuscan Decor. Enjoy! Check out country cottage decorating ideas from Switzerland, Sweden, France/Provence, and Tuscany. Learn about neutral color palettes and how you can use them for Italian country decorating. Understand what makes neutral color schemes look their best, and what happens when you inject 'real' color into neutral color palettes. It's FREE!! Return from Italian Country Decorating to Country Decorating Ideas. Return from Italian Country Decorating to the Dream Home Decorating homepage.